Your Full Service San Bernardino, CA Florist. 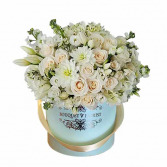 Embrace the Tiffany Blue hat box with an assortment of white flowers. 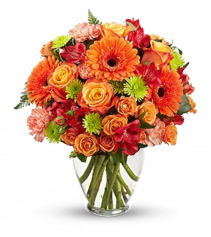 No one can resist the beauty of this bright bouquet! 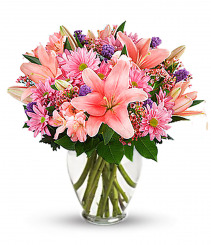 A sublime way to celebrate any occasion, this special delivery blends hot pink and lavender roses with pink lilies and lime green button mums for a look that's pure heaven. It's all artfully arranged in our exclusive, lovely glass vase they'll always treasure. The Talented San Bernardino Flower Shop. Ranked #1 on Google and Yelp For Over A Year As Your San Bernardino Florist. Send Flowers Today With Our Same-Day Delivery To San Bernardino. 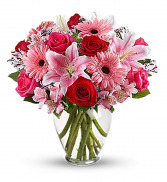 Local Florists That Will Make Your Recipient Happy! Much has been said about flowers, but we believe much should be said about gifting flowers. 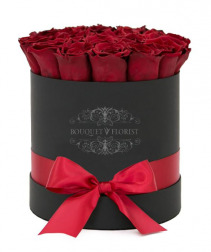 Floral gifts have been in the scene for over forty to fifty years! Flower delivery has been around since delivery trucks were starting to make its way in the mainstream media. Inland Flowers has made the process of ordering online flowers from your San Bernardino Flower Shop easy. We've made it the new thing to do. San Bernardino, CA is known for its historical landmarks such as the prestigious Route 66, Sterling Cinema Theatres, and The NOS Event Center. Our goal is to make it know for the beautiful flowers it sends around the county. Browse our catalog after you visit our website. Purchasing has never been easier. The buy now button will place your arrangement into your cart and simply give us the details of when and where and we will handle the rest! Ordering Online isn't your thing? Give us a call and speak with our floral expert. Classy. Reputable. Customer-Service oriented. These are words that describe us and we take pride in being you San Bernardino Flower Shop. We love to spend our day as if every day was world smile day! 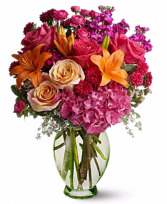 Our floral designers at Inland Bouquet Florist spend the day designing happiness for our customer's to receive. 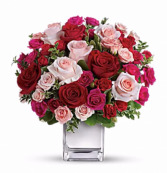 We offer fresh flowers for happy birthday flowers, Wedding flowers for your special day, anniversary flowers, funeral flowers delivered to funeral homes, corporate event flowers, valentine's day 2019 flowers, fall flowers, prom flowers, just because flowers, rose hate boxes, a dozen long stem red roses, and so much more! Looking to have customized arrangments delivered such as a gift basket or fruit basket? Look no further we will be able to help you send deliciousness to your recipient. We also deliver a wide varitey of choclate covered strawberries (if available), orchid plants, green plants, dish gardens, stuffed animals, card messages, balloons and balloon bouquets,cookies, and speciality products. We have fresh flowers for all occassions. Your flower shop in San Bernardino will put you first and make smiles be worth every penny! San Bernardino, CA is a historic, experienced city within the Inland Empire. Opened over 30 years ago, Inland Bouquet Florist is still shining in the ever expanding city of San Bernardino. Family-owned, every order is personal and designed with our customers in mind. Some of the best people come from this city and our job is to show we can be the very same. Finding a talented Redlands florist, Colton Florist, Bloomington Florist, Fontana Florist or Loma Linda Florist is more than buying cookie cutter floral arrangements. 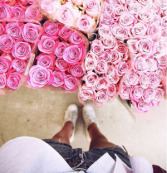 Large retailers such as Vons and Stater Bros sell cheap flowers that die in a day or two. Finding a florist should feel welcoming and personal. It should be as personal as walking your dog or getting a haircut. Bonds should be created and loved! Large florist enterprises such as a bouquet by teleflora hardly deliver the value you pay for your buck. Your personal florists will educate you and guide you to the fresh arrangement for the ocassion at hand. Inland Flowers near Waterman Ave will work with you to provide the best experience possible. 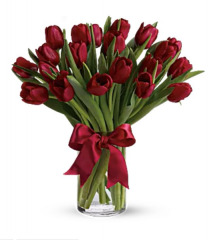 Looking for the sweetest bouquet to send to that special person? Wether you are saying I'm sorry or sending for a special day, we will design jaw dropping flowers. Flowers in San Bernardino - building relationships with our customers is our A+ game. With major standing accounts and long-time customers for years, our repeat customers share the excitement and joy with us for their floral. Wanting specific colors or certain flowers for your flower arrangement? Communication is key to receiving what you want. We will work on the clock to find whatever you want. We will work our best to accomodate all of your needs. Large retailers are unable to build personal relationships and we don't take ours for granted. 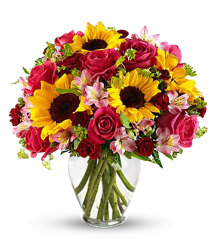 We here at Inland Bouquet Florist have the ability to build a relationship with our customers. The perfect flower arrangment rest in your imagination and our hands. Is it your anniversary and need a beautiful bouquet? Stop searching in google and allow us to help you! We specialize in love and compassion. 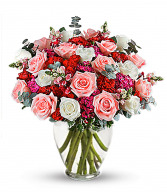 We specialize in wedding arrangements, wedding centerpieces, wedding bouquets, bouquet of roses in a box (Hat box), black hat boxes are the hot trend selling like like tulips in the early 1900s, happy birthday flowers, anniversary gifts, mothers day flowers 2019, get well soon flowers and much more. On top of that, we offer same day floral delivery and have a nationwide network to ensure your order is placed on time, any day out of the week. Click the map below for directions to our location on Google Maps! 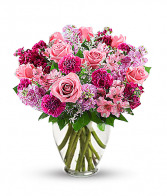 Today, customer's rarley visit the flower shop of their choice to purchase an arrangement. Delivery is the new norm. 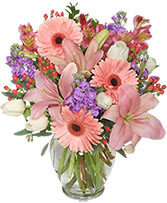 Many flowers shops only deliver arrangements within 48 hours of notice. We strive to deliver to within 24 hours upon notice and even hours on end. 80% of our deliveries are same day and even drive as far as Highland Ave. Our experienced staff will work tirelessy to make sure you are happy. Be sure to prepare and do your best to give us enough time when sending flowers. Call ahead so we may ensure fresh flowers. Affordable Flower Arrangements, Not Cheap Flowers! Look no further while in search for that perfect arrangement. 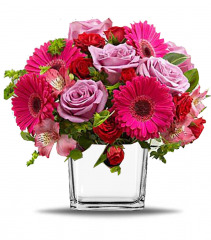 Our experienced staff can create a beautiful 100% customized flower arrangement at an affordable price. 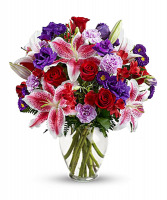 With arrangements as low as $35.99 - don’t wait, call now! 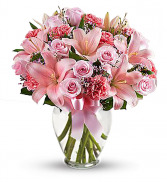 We are your number one choice for affordable flowers in San Bernardino, CA. San Bernardino CA Wedding Flowers from Your #1 Wedding Florist. Weddings may be a dream come true, but stressful before. We strive to relieve the burden with amazing customer service. We like to feel as personable as possible. You may text us or email us your wedding inspirations. If it makes your life easier, we do our best to accommodate! We have over 25+ years of floral experience ranging from classic, contemporary, vintage, romantic, modern, natural, and even gothic wedding styles! It's important to find a florist you can relate to as well as trust. We have open communication and can send you a wedding/event quote within 1-2 business days. See photos of our floral designs from our highly regarded wedding website! The depart of a beloved family member or friends should be delivered with compassion. 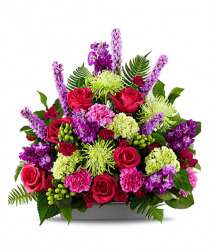 Pay your respects with a funeral arrangement such as a powerful and loving standing spray. Flowers are beauitful in they capture the serence moments of the fallen and bless us with peace and a gentle calm. All in attendence will be comforted. Inland Bouquet Florist specializes in funeral flowers for your final tribute. Google and Yelp have ranked this establishment as #1 in the City of Ser Banrdino and the Inland Empire. From funeral spreaths, funeral wreaths, to floral baskets, Inland Bouquet has over 25 years of experiece to bring about the peaceful experience wished for. We are only one phone call away. Our goal is to lessen the grief and the stress associated with these troubling times. 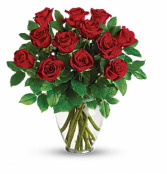 We will help with memorial arrangements and have funeral flowers delivered with ease. A difficult time is a simple explanation to describe these moments. To order flowers online, on the phone, or in person will give you the peace you deserve. Give us the opportunity to ease the pain of a heartbreaking memorial. The most common flower types at funerals, memorials, or send-to-home flowers are standing sprays, sympathy baskets, floor baskets, White sympathy standing spray, sympathy plants, All-White Roses Bouquet, The Gracious Lavender Basket, flowering plants, simply elegant spathiphyllum (peace lily plant), and Rose and Lily arrangements. The gift basket is also welcoming. A gift basket may include small items the recipient loves to help cope with the mourning process or it may be a fruit basket. No matter the arrangement of basket we will select the top products and items for your order. Memorials and Burials deserve to be decorated with love and peace. Your empathy and sympathy will be displayed with ever select flower chosen. Standing sprays or Standing Wreaths are available in many sorts and sizes. 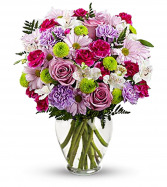 Click Here to see our flowers guide. Sizes available are 18" and 24". 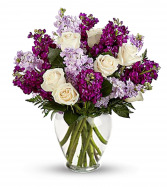 Custom sympathy arrangements are available as well. We have created NFL team-themed standing sprays and wreaths. If there is ever a custom order we would be delighted to assist you in bringing your imagination to life. Baskets - Our basket arrangements for sympathy flowers are a favorite. After the funeral, many love to take the arrangements home to enjoy their bliss. 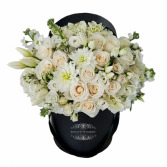 White roses are the main flower in the basket arrangements such as the peaceful white lilies basket. Fireside baskets or floor baskets as commonly called, they don't deter attention away, but rather add a subtle decor to the heartbreaking occasion, generally uplifting spirits in an all-white tribute. Cremation Wreaths - Urns also deserve floral decor. The passing of a loved one should not be left undressed with an urn alone. Flowers around the wreath create a blissful experience and gather the thoughts and warmth of the family around. Urns such as the Divine peace arrangement settle the line between passing and remembrance. Variety Often Helps in Choosing Your Funeral Flowers. 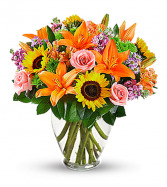 Browse our selection for beautiful flowers. Circular wreaths or funeral wreaths and standing crosses are very popular. Heart shaped wreaths display passion and adornment for the fallen. The casket spray or casket cover is an attention grabber and accents the coffin. Casket pieces are sized in two ways. A full casket or half casket. A closed casket generally houses a full casket piece while An open casket houses a half-couch casket piece. Sympathy bouquets are not limited to what is on the outside of decor. Crosses and Rosaries are popular for the inside of the coffin. 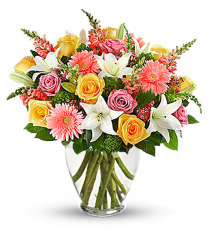 Blooming plants or sympathy gardens are a popular choice such as the peace lily, flower baskets, orchid plants, dish gardens, fruit baskets, of basket of garden blooms. Color selection is often noted as the reason many have troubles. White flowers are the classic choice as they represent peace and humility. They display peace and grace. Often times many customer's enjoy colored flowers as they may offer the cause of a celebration of life. Colorful flowers embrace the meaning of life and the memories shared. Often times Pink Flowers, Yellow Roses, And Lavender Roses express wholesomeness and rise to femine occasions such as breast cancer awareness. Green plants and the beautiful in blue arrangment is a blue toned arrangement is popular among the passing of men. Red, white, and blue flowers respents military services and honorable duty. Pink roses display feminine qualities while green plants with fresh cut flowers display male chatacterisitics. There are a variety of colors that display unique characteristics. Call us or schedule an appointment for more information. Many Floral Shops deliver on while given two days or 48 hours notice. Our shop has florists working around the clock to deliver arrangements and flowering plants when needed. Funerals generally should be placed in time for the florist to receive many of the components needed to complete the order. We understand the stress and emotions associated with funeral planning. Give us some time and we promise we will deliver on expectations. Nevertheless your funeral flower arrangement will be designed with a swift and elegant nature no matter the time restraint. Upon taking your order we will also collect the respected card message you would love to like to send with warmth and compassion. If you need sameday delivery please order before 2:30PM as it gives us enough time to create your masterpiece. We would like to thank our sponsor Black Magic Farms for supporting us in the community as we create better opportunities. The community is forever thankful for sponsoring 40 Dozens of Roses for schools, hospitals, and businesses in the San Bernardino County for Mother's Day and Valentine's Day to raise awareness of love and grace for the beauty of all relationships. Thank you from the bottom of our hearts. The community will forever remeber the special gifts donated with cheer.